Geckos can move across a body of water’s surface by using a slapping motion to hoist their bodies up, creating an air bubble which generates extra force. Scientists have found that these creatures use their size and strength to elevate themselves and move across water at impressive speeds, according to a new study. Jasmine Nirody, a Rockefeller fellow in physics and biology and her team recorded and quantified the gecko’s movements. The study, published in Current Biology, outlines a combination of techniques that the creatures use to accomplish this and other unique manoeuvres. The acrobatic lizards are agile on land sprinting across the ground, able to climb vertical walls or propel themselves through the air. Geckos are able to run at nearly 3 feet (1 m) per second over water and easily transition to speeding across solid ground or climbing up a vertical surface. Researchers recorded and quantified the animals’ movement after Adrian Jusufi, a colleague of Nirody’s at the University of California at Berkeley spotted a galloping gecko while on holiday in Singapore. Mr Jusufi recorded the little lizard as it darted between trees in a flooded area and showed it his colleagues when he returned home. The researchers’ were surprised from that an animal that size – too large to depend on surface tension alone, and too small to heave itself up by sheer force – would be capable of these movements. 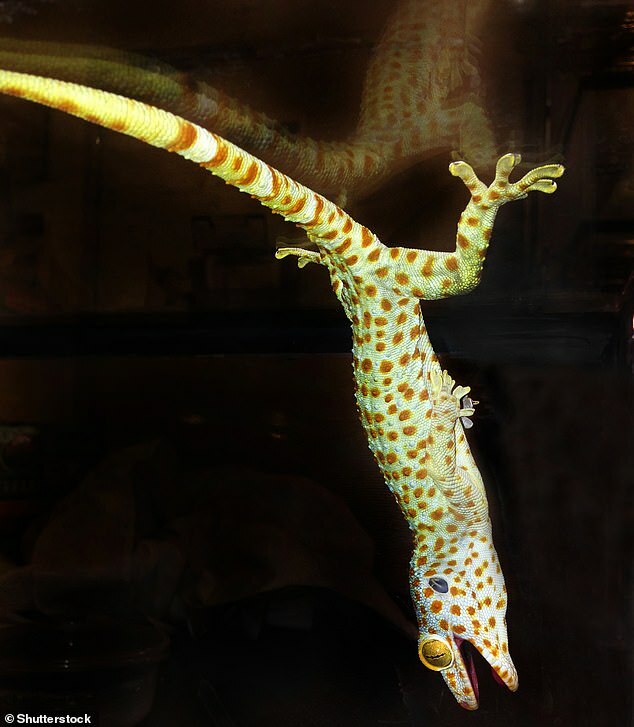 The team acquired some geckos and a tank, and ‘set out to reproduce the animals’ unlikely behaviour in the lab’. They discovered that geckos hold their heads high above the water and extend their limbs out to rapidly slap the water and propel themselves along. ‘When they hit the water they actually create an air bubble, which generates extra force and helps their body stay above the surface,’ says Nirody. ‘Still, whereas basilisks can support the entirety of their body weight with water slapping, geckos can support only about a quarter of their weight using this technique,’ explained the study. ‘Realising that geckos must employ complementary strategies to stay afloat, the researchers considered the secret weapon exploited by animals on the other end of the size spectrum: surface tension. To solidify this theory they put the geckos in soapy water, which has lower surface tension. The geckos could no longer support themselves, suggesting that surface tension was helping them stay above water. 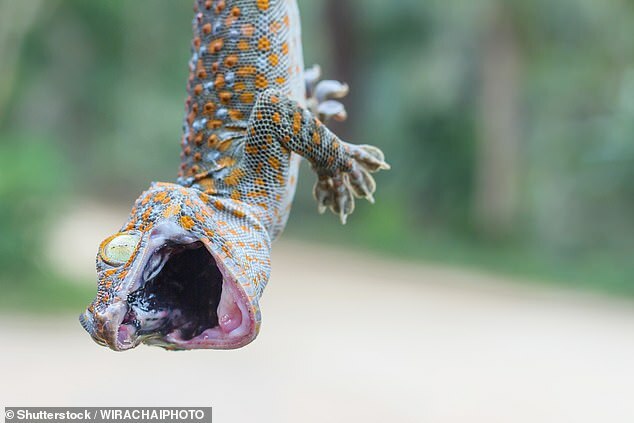 However, after performing calculations, the researchers couldn’t fully account for the gecko’s impressive elevation–leading them to discover one more feature that contributes to the animal’s aquatic agility – their skin. ‘Geckos have this amazing superhydrophobic skin that repels water and enhances their ability to stay above the surface,’ says Nirody. And the findings could one day help robots mimic the animal’s behaviour, according to Nirody. ‘An intermediate-sized water-running robot would be ideal for searching flooded areas in the case of natural disaster,’ she said. Scientists have already manufactured gecko robots that mimic the stickiness of gecko lizard feet to work in space as well as on Earth. Professor of integrative biology Robert Full of the University of California, Berkeley, said: ‘They can run up a wall at a metre per second, they can glide, they can right themselves in midair with a twist of their tail and rapidly invert under a leaf running at full speed. Sticky ‘space Velcro’ grippers based on the adhesive feet of geckos have been developed by Nasa to clear up dangerous space junk in orbit. The NASA team behind the ‘gripper’ says the technology could one day be used to create robots with sticky feet that climb around the outside of spacecraft for repairs. The device works using a grid of sticky squares on the front and arms with thin adhesive strips. These strips fold out and bend around an object like fingers, meaning it can grab curved as well as flat junk. 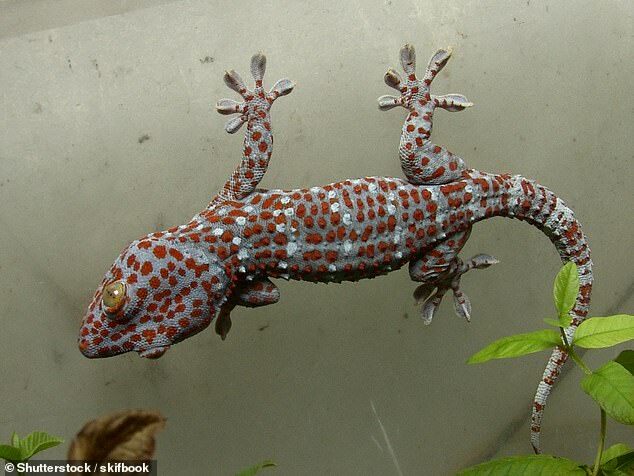 Researchers based the new design of gripper on the naturally sticky feet of geckos. The lizards have tiny microscopic flaps on their feet that create an electrostatic charge when they touch a wall. Like the lizards’ feet, the gripper’s adhesive strips have tiny flaps. It is only sticky if the flaps are pushed in a specific direction, but making it stick only requires a light push in the right direction. This is a helpful feature for the kinds of tasks a space gripper would perform.